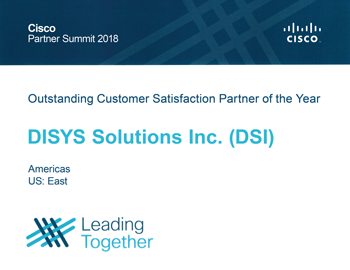 Cisco Awards DSI Partner of the Year for "Customer Satisfaction"
11/27/18 Ashburn, VA: DSI was awarded "Outstanding Customer Satisfaction Partner of the Year" for the US East at the Cisco Partner Summit held November 12–15, 2018 in Las Vegas, Nevada. DSI has previously won "Partner of the Year" in various categories, including the Customer Satisfaction award at the 2016 Partner Summit. "We are extremely honored to receive this award from Cisco," said Alan Bechara, Sr. Vice President of Sales and Marketing. "Customer satisfaction is one of our top priorities and our team works hard every day to provide the best service to our current and future customers. It means a great deal that Cisco recognizes our efforts for something that is so important to us." The Cisco Partner Summit welcomed over 2,000 attendees from Cisco’s worldwide partner companies. At this annual event, Cisco reveals new technology and ideas aimed at keeping their partners ahead of the competition. This year’s theme was "Leading Together", which focused on the Customer Experience and working with partners "to harness our collective power to deliver unrivaled value and achieve breakout success."